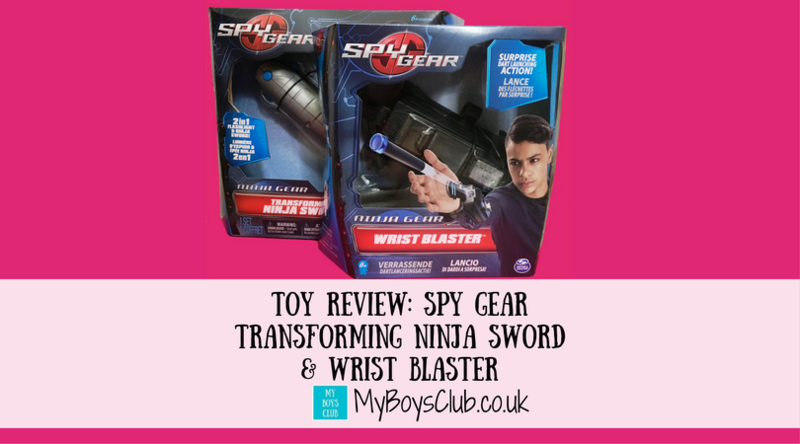 With two boys who love both karate and soft-dart style guns, I had no doubt that they would both jump at the chance to review two new Spy Gear toys by Spinmaster, a company that aims to design and market innovative products that "wow". The Spy Gear Transforming Ninja Sword was the first we opened. 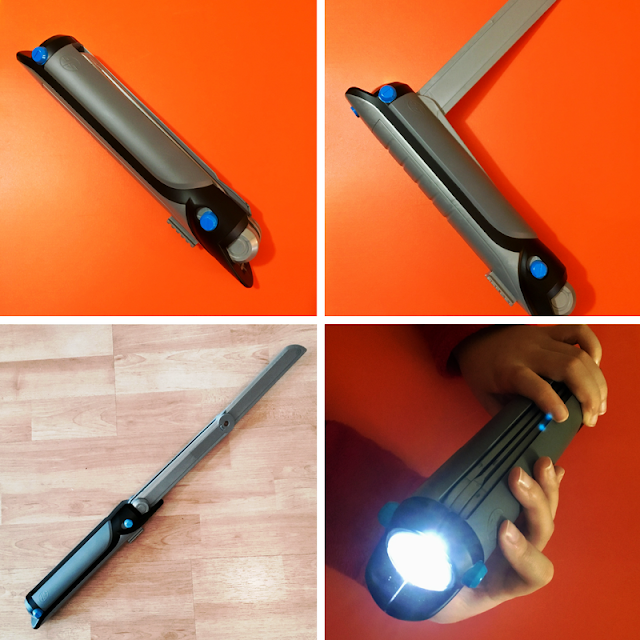 This is a 2-in-1 ninja tool which transforms into a sword at the touch of a button. It can also be an ninja scythe and has a flashlight to help seek out your opponent. It is aimed at children between the ages of 6 and 8 and both my boys, aged 7 & 9, enjoyed playing with it. There are instructions on the back of the box and it also comes with a user guide, however, my boys worked out how to use it without reading these. Simple to operate they easily got the hang of it without my help. It also comes with the three batteries the toy requires included, which means it is ready to go as soon as you take it out of the box. Ninjas and spies at the ready. The boys really loved playing with this. 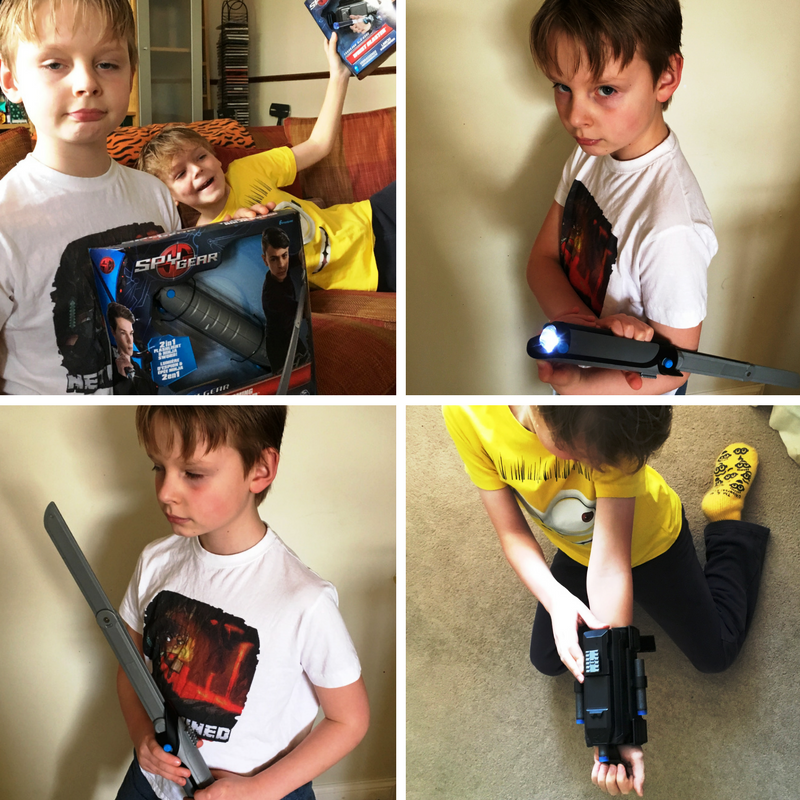 They just couldn’t help themselves pick it up, activate the blade and pretend to be a ninja – long after we’d finished reviewing the toy! They did say though that you do have to make sure you are holding the sword away from you when you transform it, to avoid hitting yourself with the toy. Currently available for £16.74 from Amazon. If we thought the sword was good then we were equally if not even more impressed by the Ninja Wrist Blaster from Spy Gear. Again with instructions on the back of the box and a leaflet inside, it is simple and easy to use. This toy does not require batteries. To know how to fire the dart we did have to read the instructions, but the darts are very easy to load and the pull-back slider is easy to move, even for small hands. 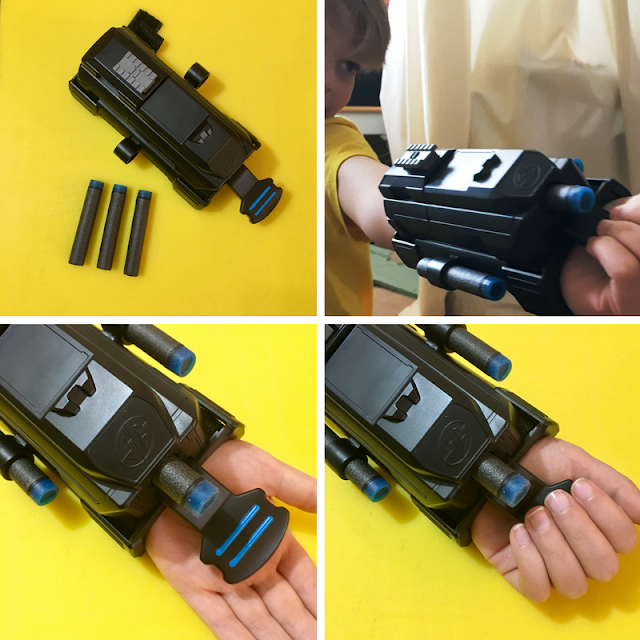 It has two adjustable velcro straps, large enough for big kids to use too, that strap the blaster onto your wrist, and once loaded a quick squeeze of the fingers into towards the hand fires the soft dart. The design of the blaster means it can be hidden under clothing, as long as it is quite loose, or down by your side when playing to surprise your ‘enemies’. The darts are sticky so stick to doors, ceilings, anything really and the boys used them on existing targets and said the aim was great. This toy is again aimed at children over 6 and was loved by my 7 & 9-year-old. The only downside they have found is that because the darts are sticky when they do stick to the ceiling they need a taller person to get them down! However, they have already discovered that their other soft darts also fit the Ninja Wrist Blaster. Be warned the darts fire (one at a time) at some speed making the toy lots of fun to play with. Currently available for £14.49 from Amazon. These are the first Spy Gear toys we have seen but at really good prices I think we'll be checking out more of the range. We received the samples for the purposes of writing this review, however, all thoughts and opinions and images are our own. Includes Amazon affiliate links. Oooh they look like great toys! These look excellent as something different for children of that age. Especially the wrist blaster, I think I'd still find that exciting at my age! My son is a bit young for toys like this, but I know my husband would have great fun with these - especially the wrist blaster! These look great! I like that the sword comes with batteries too!! These look fab! My boys are spy obsessed!